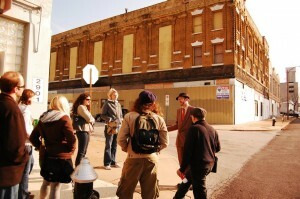 Michael R. Allen discussing the Castle Ballroom on a tour of midtown musical heritage sites. Architectural tours should be playful. When St. Louis needs expert architectural tours, it turns to Preservation Research Office. Our architectural tours combine deep knowledge, routes tailored to each group and a light-hearted storytelling approach. We don’t offer “just the facts” — we put the facts together to connect them to the lives we live today. We have given tours everywhere from the private places of the Central West End to the forested vacant lot where the Pruitt-Igoe housing projects stood. Buildings are all around us, and any place is worth examining further. We can help you understand a new place or your own neighborhood. Recently, PRO has provided tours for the St. Louis Art Museum, Washington University, Teach for America, St. Louis University, Fontbonne University, the Missouri History Museum, the Business History Conference, the Rehabbers Club, South City Open Studio and Gallery, Landmarks Association of St. Louis, Nevermore Jazz Ball and other organizations. PRO Director Michael Allen is a frequent guide for area conferences, with his most recent appearance being a three-hour bus tour of north St. Louis for a sold-out bus at the Monument/Anti-Monument Conference sponsored by the Sculpture City initiative (April 2014). Last year, Allen’s spirited “That Summer Fields Grew High” looked at architecture and agriculture in north city, and drew over 70 participants (August 2013). 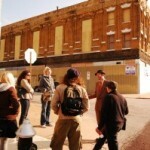 We can guide groups around city neighborhoods, showing significant landmarks and providing general history. Typically, our tours are 90 minutes long, but we can adjust time to suit. Neighborhoods and areas that we routinely tour include Downtown, the Central West End, Midtown, Old North, Tower Grove Park, Hyde Park and the Pruitt-Igoe site. We can guide bus tours for the entire ride, or just part of it. We have experience providing bus tours inclusive of the entire city, or covering architectural themes like mid-century modern houses, public buildings and others. Want to see a place, neighborhood or part of the region through the eyes of an architectural historian? Work with us to create your own customized architectural tour. Do you have a large, thematic, or complex historic tour in mind? Let us help you plan your experience to ensure you get the most out of your event. Are you an aspiring historic guide yourself? Our staff can help you prepare to be a resourceful, dynamic historic preservation guide who is prepared for anything. Contact PRO to find out more about our coaching and training services. 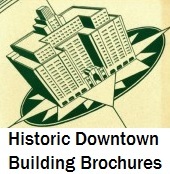 Get Started: 314-920-5680 or contact@preservationresearch.com.